VB Came to Our School — So? | What's the issue? "I'm not interested in fashion, generally"
VB Came to Our School — So? Victoria Beckham (pictured left) gave a talk at LASALLE College of the Arts last Wednesday, May 14th 2014. Perhaps I’m still too naive to assume that designer talks, especially those arranged by a design and arts school, would be permeated with discussions of substantial issues, an open dialogue with challenging questions and prompt a great deal of critical thinking. That was not the case when I attended LASALLE College of The Arts’ talk with the one and only Victoria Beckham. The designer recently visited Jakarta and Singapore as part of her tour to promote the collaboration between her eponymous line and OnPedder. What can one expect out of a talk with her? I’m in no way trying to belittle Beckham, but I am questioning why her coming here was so hyped. I was excited, yes, but I soon recall what Mark Oflaherty wrote, “The urge to post anything and everything linked to a fashion event has become frenzied, hysterical and masturbatory,“ which is true, and is an accurate description of Beckham’s event. Everyone went on a frenzy because Victoria Beckham was in our school. Her arrival was welcomed with a standing ovation, accompanied by an uproar of wows and yeahs over a loud applause. It’s indicative of why it’s difficult to take her seriously as an industry figure. I can imagine anyone would be nervous to be face to face with the mother of four and wife of football superstar David Beckham, who’s always shunned by the press for not ever smiling (she did, however, crack a lot of jokes that day). 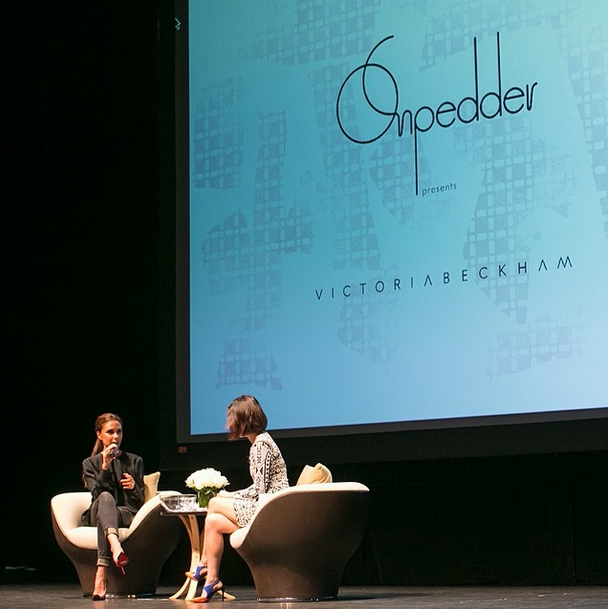 So, kudos to my lecturer who had the opportunity to talk with Victoria Beckham. I can understand that with her history of the Spice Girls days, reputation as style icon, and her adorable children, people would tend to ask personal questions. I had slight reservations of that, but have come to terms with it… somewhat. In a short session of thirty minutes, the talk was fundamentally answering questions chosen out of a fish bowl. The presenter and guest each took turns to select. But it was a little disappointing that many of the queries were more appropriate for a meet and greet event. My understanding was that it wasn’t, since the setting was at school questions like “Would Victoria Beckham ever find itself collaborating with H&M?” was more appropriate, despite sounding a little like it came from a curious fan. You get the point. My concern was that the talk fell a little flat, and was dominated with more trivial questions? But perhaps, it’s the classic case of expecting too much of a talk, which is a recurrent phenomenon for a nosy student like myself. Beckham’s knowledge is always likely to be diminished by her reputation as a public figure. I was delighted when she was open to discuss her transformation from being a pop star to a legitimate clothes maker. The only few other successful celebrity lines I can think of are The Row (which I love) by the Olsen Sisters, Kimora Lee Simons’ Baby Phat, Rocawear by Jay Z, Rachel Zoe’s eponymous line and Gwen Stefani’s L.A.M.B, which I used to frequently by as the most labile thirteen year old. Although it seems extensive in a sentence, it really isn’t a lot compared to how many lines are actually established by celebrities yearly. Let’s get back to Beckham. Her insight is actually valuable, and as students we ought to have an open attitude feed our minds with industry insight. I understand the skepticism that surrounded her initially. But she had after all, had experiences with fashion licenses, web commerce, and as a guest, edited a reputable publication – doesn’t that stand for her credibility? Beckham revealed, “I’ve never done this to prove anyone anything as much as it is to myself. I love what I do and I can’t think of doing anything else,” Even if her fashion ventures were not totally independent, the woman has cemented her reputation as a designer. In my opinion, her foray into fashion has been a formidable one, and her healthy, growing brand is evidence. The brand will be opening a flagship store in London, her e-commerce endeavour is growing and she is opening a digital marketing intern which you can apply for here. My only reservations with Beckham is really, the perpetuation of taste as superiority, which high fashion is always dictating. She’s even stated that she designs for women with “the level of my taste” repeatedly in her interview. I find that disturbing, but not surprising. I’m beginning to think these talks are easily predictable, anyway. There is nothing wrong about asking her what music has she been listening to, or if the Spice Girls will ever have a reunion. But for certain, that was not what I came for. The ubiquity of luxury — Zach Duane, the Victoria Beckham CEO, previously mentioned in a BOF interview the opening a flagship store in London’s Dover Street. The brand’s distribution was initially apologetic, but at the present is stocked at 240 retail stores globally. Here’s the special thing about Singapore: in a land less than 710km, we have five Louis Vuitton and Hermes boutiques situated within the city area. This is very concentrated, even when compared to Hong Kong, that has eight stores erected within 1,104 km of land. Luxury is always being redefined, but isn’t abundance and accessibility taking away the luxury element? From personal experience, buying a Prada bag is as convenient and special as getting groceries from the supermarket. Might I add that Singapore is notorious for their botchy, snobby service. You might also want to read Hung’s recent article on the matter. Student internships — This was the question selected by my lecturers. It was a two part question, but not delivered completely. The label is now looking for online marketing interns, (you can apply here, if you’re interested) and with Beckham’s status and reputation, a lot of talented, eager students will be competing for the job. I’m interested in the process to find reasoning why she decided to scout candidates internationally. More importantly, as someone closely associated with the likes of Anna Wintour, she should be aware that key figures in the industry, and not limited to fashion, have and are still perpetuating unpaid internships as acceptable practice. Reality of design — My concern has always been the fact that women always envision their best when visiting and shopping at luxury retail stores. We don’t take into account that we can feel crappy, lazy, or even fat on certain days, rendering the dress or skirt or pants or pair of shoes unwearable. Regardless of gender, this is why we end up having a hundred of clothes in our closet, with nothing to wear when facing it. I’m keen on how she will translate that into her new experience-heavy store. In no way do I purposely or intend to belittle or purely criticise schools, because I’m totally grateful of all the opportunities presented to us. Instead, it is written to empower all the people that I know are out there who might be shy to ask questions or participate. I was definitely not the most vocal or conscientious person to begin with, so I want you all to be encouraged to speak up! I will leave this here, and post the continuation of this article on Getting More From Talks. Next PostWhat Makes A Talk Fruitful?